Action Alert | California Trout, Inc. The Army Corps of Engineers (Corps) and the Environmental Protection Agency (EPA) are proposing significant rollbacks to the protections of the Clean Water Act. Submit your comments TODAY to defend our clean water. Help us tell the Corps and EPA to withdraw this proposed rule change and commit to building rule changes based on sound science. You can use the form on this page to submit a comment. Thank you for your support. 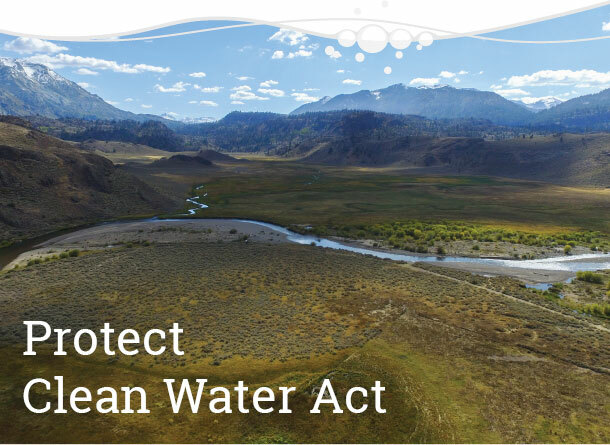 The proposed changes would remove protections on intermittent and ephemeral streams, wetlands, and millions of miles of rivers and streams across the country setting a dangerous precedent that will set our country’s water protections back generations. These rule changes are not based on science and ignore the fact that streams and wetlands are essential and interconnected elements of watersheds. These rules will pave the way to the destruction of wetlands and we will see increased risks of flooding, loss of carbon sequestration potential, and decreased water quality. The Clean Water Act was built to protect our nation’s waterways from source waters to estuaries and this rule change is at odds with the very intention of the Act itself. California’s serene beachscapes and mountain-fed springs may make more appearances on desktop wallpapers, but the state owes a lot of its biological diversity—and precious groundwater—to a humbler landscape. The vernal pools that stretch from Baja California to Washington are cyclical wetlands. Shallow divots accumulate water during wet winter months and dry up in the heat of late spring. Like prairie potholes and playas, the 2015 Clean Water Rule specifically protects these temporary wetlands in California’s Central Valley, coastal terraces, and mountains. The rule cites the pools’ importance in absorbing flood waters and their consistent, if temporary, connection to the region’s waterways. Connections are most apparent when the pools overflow, but also exist through subterranean links. The fact that vernal pools do not have year-round connections to streams and rivers is exactly what makes them biologically irreplaceable. The fleeting puddles aren’t suitable for species that prey on amphibian eggs, so they’re a safe place for other animals to breed. They also support semiaquatic plants that would otherwise be overruled. If the pools were totally full or completely dry through all four seasons, plants that favor either of those climates would take over the fauna that thrives in the cyclical ecosystem. Large farming operations and urban sprawl have decimated nearly 90 percent of western vernal pools in the Central Valley. Even with federal protection, those that remain are threatened by extreme heat and drought brought on by climate change. The potential rule change would affect small pockets of wetlands that add up to millions of acres. Without protection, farmers can expand into these areas, and developers can extend roads or erect suburbs over them. While eliminating the Clean Water Rule could open up critical patches of habitat to destruction, some farmers fear the strict regulations interfere with their operations.